What is Microsoft Office Professional 2016? Microsoft Office Professional 2016 is a business productivity suite of interrelated desktop applications that tackle different aspects of your operations. It includes seven essential programs that enable you to process texts, create immersive presentations, process numerical data, take notes, organize emails, and more. You can seamlessly utilize Microsoft Office Professional 2016 whether you prefer working with a keyboard and a mouse, a touchscreen, or a pen. This way, you can capture your ideas comfortably and navigate the interfaces of various applications with ease. Microsoft Office Professional 2016 has the necessary tools you need to run a home-based or a small business. With this suite, you can create, edit, and share documents, presentations, spreadsheets, and other files via email. You can even publish them on the web where they are accessible to a larger and public audience. Rather than relying on email attachments and online file storages for sharing work files, you can upload your working documents to Office Online instead. This enables you to collaborate on files with your team or with external associates in real-time. As such, you can share ideas and enhance your content quickly, together. Though you can utilize Office Online for web-based file sharing and editing, your documents are private and closed to others unless you invite them. By sending your collaborators invitation emails containing links to your files, you enable them to simply view or review and edit them. This means that you have full control of the accession rights of your documents. With Microsoft Office Professional 2016, you can start a file from scratch or you can opt to customize a template. The business suite’s applications have a library of templates pre-installed that you can edit to your specifications. If the current batch of templates are not enough for your needs, you can download new ones from the Microsoft Office website. When you are reading an Office document, Microsoft automatically offers you insights based on the content. The software connects with Bing to give you additional information from the web so you no longer have to switch between the application and your preferred internet browser to look up information. Every application in the Microsoft Office Professional 2016 has an integrated search bar. Whenever you require help, you can simply input what you want to do and it will list your options. For example, if you want to add a table in Word and you type in “create table”, the intuitive help box outlines different actions related to tables. If you are considering Microsoft Office Professional 2016 it might also be beneficial to check out other subcategories of Best Office Software gathered in our database of SaaS software reviews. Since each company has unique business needs, it is sensible for them to refrain from searching for a one-size-fits-all perfect software system. Needless to say, it would be pointless to try to find such an app even among market-leading software applications. The intelligent thing to do would be to list the various essential factors that need consideration such as main features, budget, skill levels of workers, company size etc. Then, you should do your research thoroughly. Read some Microsoft Office Professional 2016 reviews and look into each of the other apps in your shortlist in detail. Such comprehensive groundwork can ensure you discard ill-fitting applications and zero in on the app that presents all the elements you need for business success. How Much Does Microsoft Office Professional 2016 Cost? We realize that when you make a decision to buy Office Software it’s important not only to see how experts evaluate it in their reviews, but also to find out if the real people and companies that buy it are actually satisfied with the product. That’s why we’ve created our behavior-based Customer Satisfaction Algorithm™ that gathers customer reviews, comments and Microsoft Office Professional 2016 reviews across a wide range of social media sites. The data is then presented in an easy to digest form showing how many people had positive and negative experience with Microsoft Office Professional 2016. With that information at hand you should be equipped to make an informed buying decision that you won’t regret. 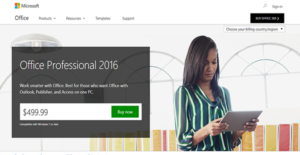 What are Microsoft Office Professional 2016 pricing details? What integrations are available for Microsoft Office Professional 2016? If you need more information about Microsoft Office Professional 2016 or you simply have a question let us know what you need and we’ll forward your request directly to the vendor.